Current Affair is the most dynamic and challenging portion of the IAS Preparation which should be studied in depth. UPSC IAS Prelims Preparation requires a deep consolidation and fundamental knowledge of the current happenings in the country and around the world. 1. Under the Treaty, the waters of western Rivers are allocated to India. 2. Under the Treaty, India and Pakistan have each created a permanent post of Commissioner for Indus Waters. They together constitute the Permanent Indus Commission (PIC), which is entrusted with the implementation of the Treaty. 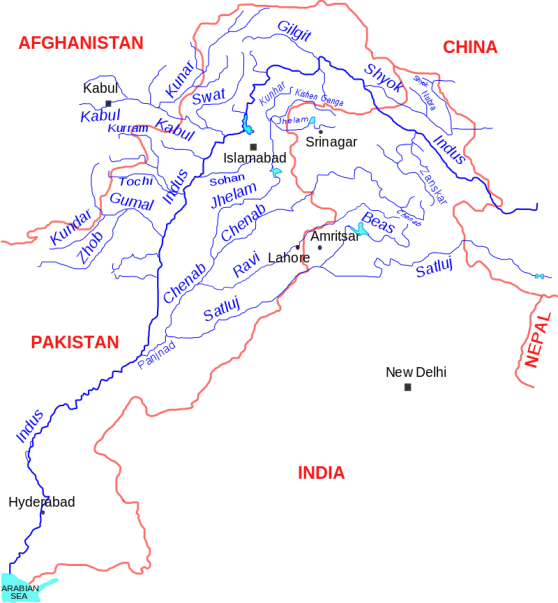 The Indus system of rivers comprises three Eastern Rivers (Ravi, Beas and Sutlej and their tributaries) and three Western Rivers (Indus, Jhelum and Chenab and their tributaries). 1. Under the Treaty, the waters of Eastern Rivers are allocated to India. India is under obligation to let flow the waters of the Western Rivers. 2. India has been permitted to construct storage of water on Western Rivers up to 3.6 MAF for various purposes. No storage has been developed so far. 3. Under the Treaty, India and Pakistan have each created a permanent post of Commissioner for Indus Waters. They together constitute the Permanent Indus Commission (PIC), which is entrusted with the implementation of the Treaty. 4. Both sides are required to exchange information related to river flows observed by them, not later than three months of their observation and to exchange specified information on Agricultural Use every year. Q 2. With which country has India given approval for signing of an Undertaking on Mutual Recognition of Certificates for seafarers? This Undertaking will pave way for recognition of maritime education and training, certificates of competency, endorsements, training documentary evidence and medical fitness certificates for seafarers issued by the Government of the other country. It is done in accordance with the provisions of regulation of the STCW Convention, and cooperation between the two countries in the training, certification and management of seafarers. Q 3. Recently, India has been ranked as the 39th most competitive economy in the world in the Global Competitiveness report. Which organization publishes this report? The Global Competitiveness Report is published by the World Economic Forum since 2004. The Global Competitiveness Index integrates the macroeconomic and the micro/business aspects of competitiveness into a single index. The GCI separates countries into three specific stages: factor-driven, efficiency-driven, and innovation-driven, each implying a growing degree of complexity in the operation of the economy. Q 4. Recently, with which country has the government of India approved to sign a Memorandum of Understanding (MoU) in the field of Industrial Property Cooperation? • Exchange of best practices, experiences and knowledge on Intellectual Property awareness among the public, businesses and educational institutions of both countries. • Cooperation in the development of automation and implementation of modernization projects. • Partnership in IP-related training for local IP and business communities. Q 5. The Indus water system is very crucial for economy of Indian subcontinent. Which of the following rivers do not originate in India? The Indus River is a major south-flowing river in South Asia. Originating in the western part of Tibet in the vicinity of Mount Kailash and Lake Manasarovar, the river runs a course through Ladakh, Gilgit-Baltistan, and Khyber Pakhtunkhwa, and then flows along the entire length of Punjab to merge into the Arabian Sea near the port city of Karachi in Sindh. It is the longest river of Pakistan. Q 6. India hosted its 1st Young Scientists Conclave under the framework of which association? The BRICS Young Scientist Forum (BRICS-YSF), under which the BRICS Young Scientists Conclave is being organized, was initiated at the 2nd BRICS Science, Technology and Innovation Ministerial Meeting. The Department of Science & Technology (DST), Government of India, under the BRICS framework, is hosting the Young Scientists Conclave where a group of scientists from BRICS countries will be meeting. 1.The meet would provide a platform for engaging, connecting and networking among young scientists to hold discussions and find solutions to some of the common challenges and problems being faced in BRICS countries. 2.The participants are drawn from science, engineering and allied disciplines. The focus of the Conclave would be on three thematic topics – Computational Intelligence, Energy Solutions and Affordable Healthcare. 3.It will pave way for creation of strong generation of S&T leadership that can accelerate change collectively. Q 7. Consider the following statements regarding surgical strikes? 1.A surgical strike in military terms is an operation that is intended to take out a specific target, with no or limited collateral damage. 2.By the Air Force, it can be an aircraft targeting a single building or vehicle, as opposed to carpet bombing an area. A swift and targeted attack with the aim of minimum collateral damage to the nearby areas and civilians is a surgical strike. A surgical strike is a military attack which is intended to result in only damage to the intended legitimate military target, and no or minimal collateral damage to surrounding structures, vehicles, buildings, or the general public infrastructure and utilities. Neutralization of targets with surgical strikes also prevents escalation to a full blown war. Surgical strike attacks can be carried out via air strike, airdropping special ops teams or a swift ground operation or by sending special troops. Precision bombing is another example of a surgical strike carried out by aircraft – it can be contrasted against carpet bombing, the latter which results in high collateral damage and a wide range of destruction over an affected area which may or may not include high civilian casualties.